better than i could have imagined: Letter of the Week: D is for Daddy! This week- I decided for us to do letter D....for Daddy.... as our letter of the week. The first activity we did ....I drew a big D on a piece of construction paper. Then I had her put the Dots wherever she wanted. This was a good fine motor activity, as well, since she had to pull the backs off of the Dots (they are really just self-adhesive foam circles). Then we hung it up on our clothesline display! Dirt!!! This idea is from No Time for Flashcards....and was just a lot of fun. We crushed up Oreos for the Dirt....then added in milk chocolate rocks (found at Wal-Mart and a little pricey....felt guilty about buying them....still do.....but she did love them)....chocolate pudding.....and gummy worms. Payton came over to eat Dirt with us.....and this is totally non-related....but check out her gorgeous baby blues!! Parker's loved eating those milk chocolate rocks! She will even still say from time to time in a whiny voice, "But I need rooooocks!!!" We painted Dinosaur eggs!! 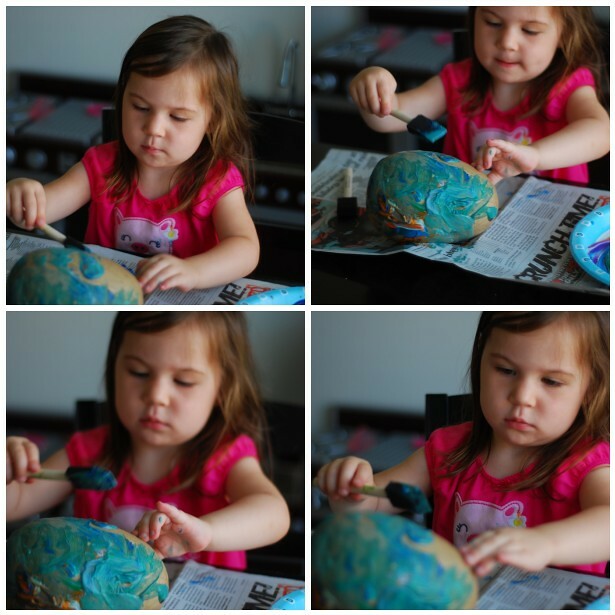 I got the large paper mache eggs at Hobby Lobby and let her paint them! We talked about how D was for Dinosaur and the sound that D made. I have a lot of pictures here of her doing this activity because, on this morning, she was so very into this activity---you can tell by her facial expressions. More than she is most of the time. 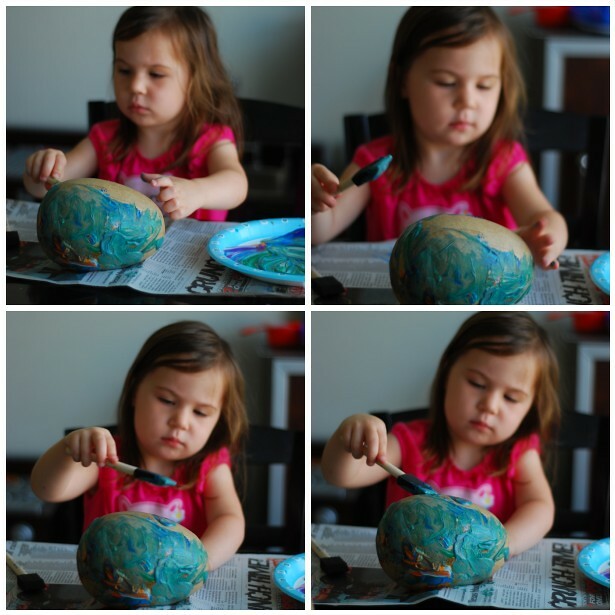 And in looking back at these pictures....it made me smile because she really took this activity seriously and was so careful to paint the entire egg. She painted this one all by herself....and there were 2 left that she asked me to paint with her....so I did. Such great quality time with her that morning. And she was so proud to show her Daddy when he woke up! One morning we watched an episode of Dinosaur Train that I had recorded. I think I may need to let her watch a little TV every morning. I was able to get the kitchen cleaned up in peace! Haha! She turned around quickly and I snapped this shot. Her mouth is full of pancakes....but love the joy in her face! And she had a Dinosaur-sharped peanutbutter and jelly sandwich for lunch. And one day this past week....we visited my Granny. Here- she is watching Barney...the purple Dinosaur! She had never really watched this show before....but this is a show that Payton will actually watch since they have a lot of dancing and singing. I made Lovey a Diaper!! Parker loved this and I was continuously grinning ear to ear for the first 10 minutes that she had this Diaper in her possession. I got the template here from Skip to My Lou .....it's free and really easy to make. This was also super exciting to me because my mom made us Diapers just like this for our Dolls when we were kids. So happy and so very proud!!! Totally worth it! Parker went on a Date with her Daddy one morning to get Donuts and then to Home Depot. I did not get any pictures of this because...well....I was not there! But........never fear! My friend, Jenny, came through with a really, really cute Donut-man from a Donut shop near her parents house! Thanks, Jenny and JP! Parker absolutely loved it! And the sugar rush that followed! Haha! And because it is D week.....and Parker had Donuts......it was only fair for Lovey to have Donuts, too!! So I made this felt Donut with a template found here....also from Skip to My Lou. She wanted to take a picture with Lovey. One evening.....Parker made a Dump cake with her Daddy! This is a great activity for kids in the kitchen. We have done this once before...and you can go here to see the play by play and ingredients we used. And what's even better.....this cake is delicious!!! We also made Daisy magnets! And I use the term 'we' very loosely here! I got the idea from here....and made a few modifications. Where I went wrong is.....I used fabri-tac glue because I really wanted all of the pieces to stick and not fall off. But I didn't really want her to touch the glue. So she quickly became bored (and rightfully so). I went ahead and finished the project just to share...but definitely think this activity would be better for an older child. However.....she does enjoy looking at her magnets ont he refrigerator! They are her Daisy's! D is for Dr. Pepper!! And NO.....I did not let her have her own Dr. Pepper. She does love the stuff.....that's why we don't keep it around anymore! But on this day....I got one...drank it all....and let her have the watered down Dr. Pepper-laden ice. I still have quite a few D activities to do....and after this next week (M is for Mommy)....I plan on having a review week....so hopefully we will get those activities in then! To see our first "Letter of the Week: P"....visit here. Visit 1+1+1=1 to see many more great activities for various age groups! I have gotten many great ideas here! I just love these so much! What a great week and full of fun things with the letter D!!! Love the donuts... too cute!!! You are so good, you would make a great Kindergarten teacher. I can't wait to see what you do for the letter M.
Love it all! I really love the diaper for Lovey. That was so sweet of you to make! It looks like you had so much fun! I love the dirt- we did this when I taught preschool (& even planted fake flowers in it)... I'll have to try it with my own kiddos. So fun! Love all the wonderful activities you guys did this week. Especially the dirt and dinosaur activities look like so much fun. My son would love them as well :) Thanks so much for sharing! Thank you for linking up to the Ultimate Alphabet Craft Collection! This is a fantastic idea for the letter D! Also, your blog and your photography are just stunning!